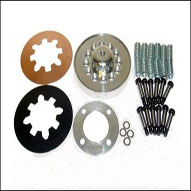 UC-1000 The Ultimate Clutch includes two diaphragm springs, spring collar, 12 springs and shoulder bolts. BDL's high performance clutch lets you choose between a diaphragm or coil spring application. Our kit will fit any BDL belt - open or closed. For stock applications, use the black diaphragm only or for a more stronger spring pressure use the copper colored diaphragm. For high performance motorcycles, use both diaphragm springs. For even more spring pressure, place the washers under the head of the shoulder bolt. For stock applications, you can use as few as four springs. For high performance motorcycles, use eight to 12 springs depending on you individual application. NOTE: To achieve the proper spring tension for your application, you can add or subtract springs. Start with six or use any combination up to 12 springs. Most high performance applications will only need eight or nine springs.